As a Gree-nglish family we have become accustomed to segue fairly seamlessly between Greek and English culture. There is a remarkably even-handed choice between food, customs and idiosyncrasies of both countries. Favourite family meals could be moussaká or equally meat and potato pie; our kettle is absolutely indispensable but we never use a washing-up bowl. My Greek husband loves a cup of tea – complete with milk – and I’m rather partial to a good frappé. The kids owe allegiance to both countries but the trickiest dilemma will always be a Greece v England football match – fortunately that doesn’t happen too often ! Let’s just say that mentioning Beckham’s goal in the crucial 2001 showdown is taboo. When it comes to high days and holidays things can get a little confusing. Usually Easter is realtively straightforward – more often than not the different religious calendars mean that we get two shots at it. It’s fair to say that of the two, a full-blown Greek Easter is this family’s favourite by far. Christmas though is an entirely different matter . Over the years our Christmas has developed into a sort of tandem celebration. We have both a Christmas tree and a decorated sailboat, ‘á la grecque’. The children used to put out stockings on Christmas Eve, with the usual treats for Santa too, but on New Year’s Day we cut a Vassilópita. It is done with all the customary wishes and the blessings for us, our relatives, absent friends, Jesus and the poor. 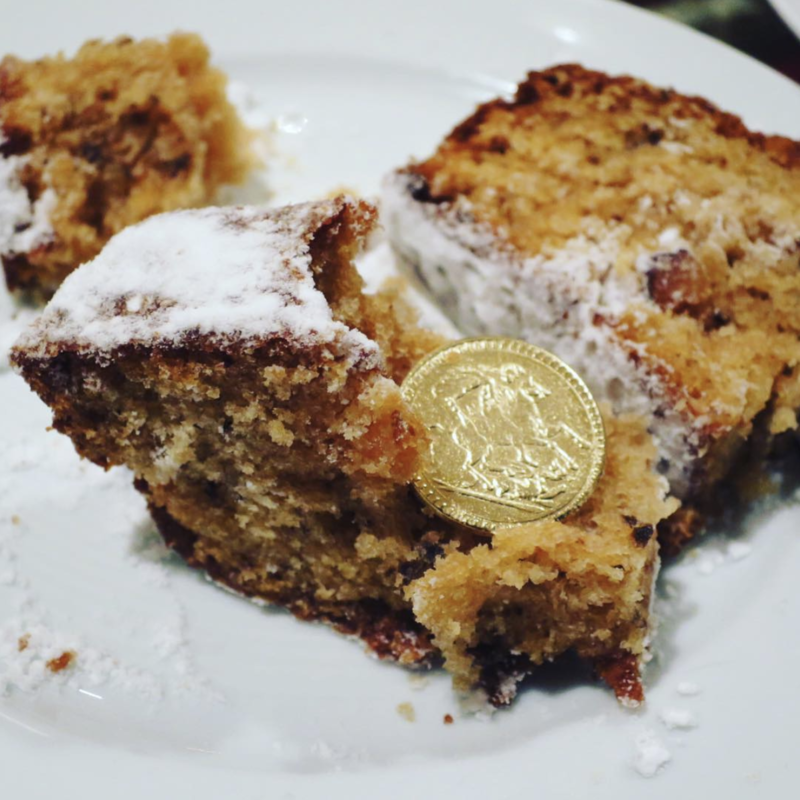 Curiously, there is always much more excitement over who gets the coin in the Vassilópita than for the one in the Christmas pudding – I cannot quite explain why. Out of all of this a truly mongrel recipe has been born. I worked out early on that baking two lots of Christmas goodies was unfeasible and, frankly just over the top. 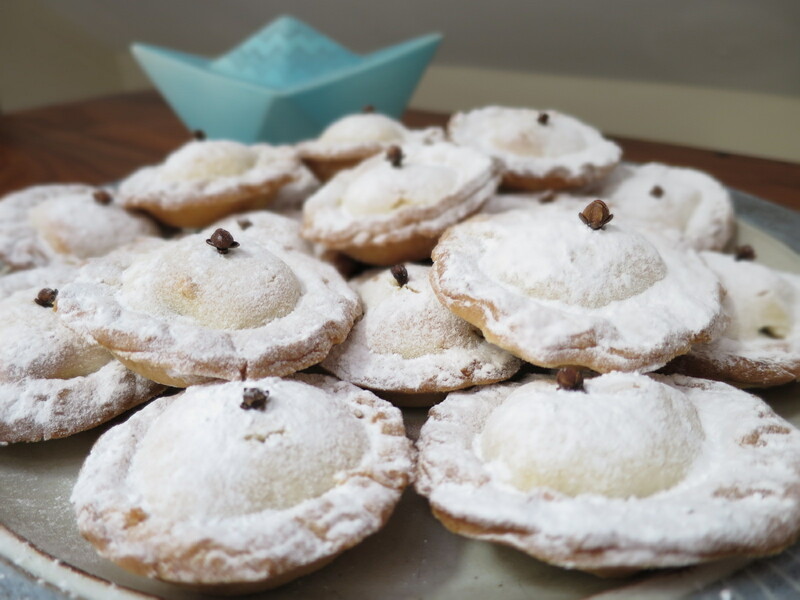 Melomakárona, those delectable, honey-drenched, spiced cakes are clear favourites, so they are always present. Traditional British Christmas cake did not make it in our popularity contest and has been dropped. The Anglo-Saxon in me couldn’t bring myself to leave Father Christmas a kourambié along with his glass of sherry, so in a moment of madness the solution to that conundrum was born. 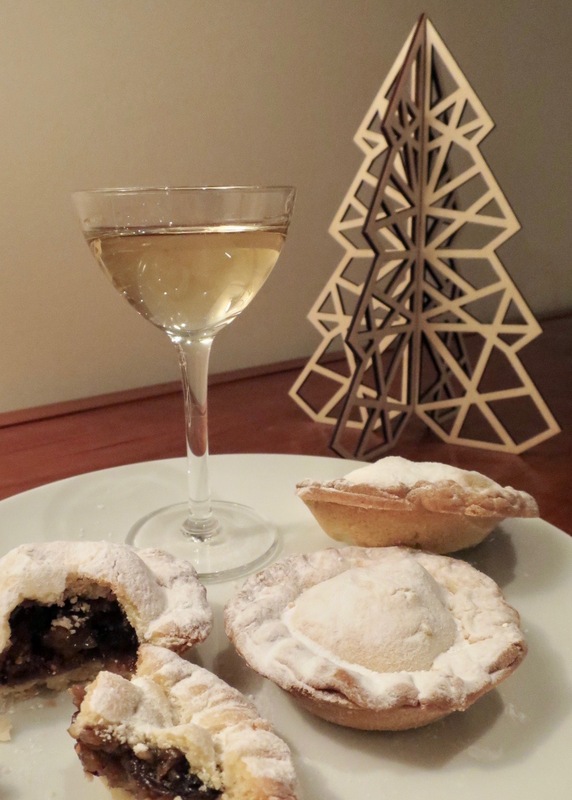 Mince Pies with Kourambié Pastry. 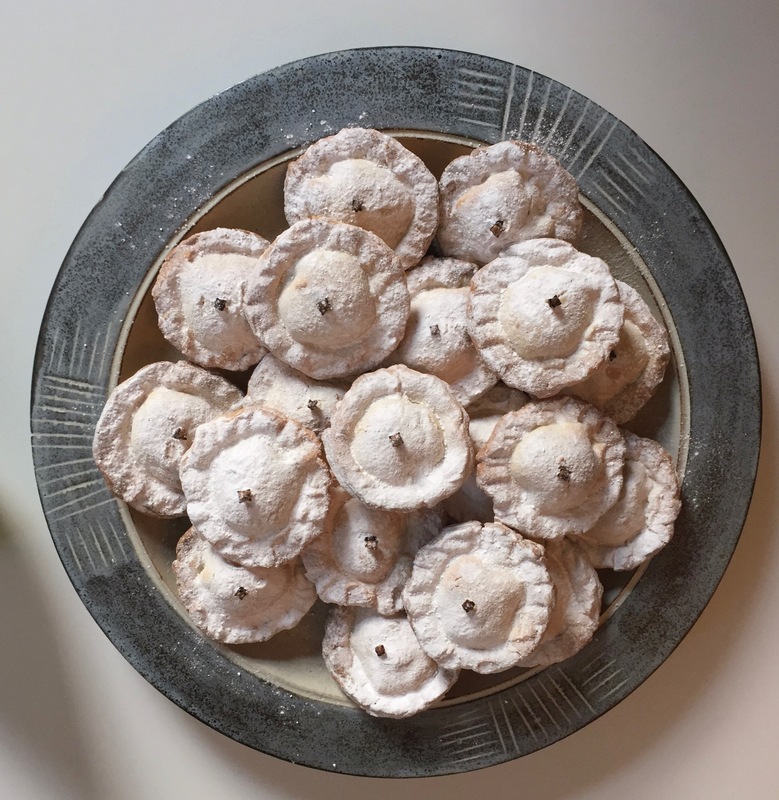 Kourambiédes are the greek Christmas biscuits made from ground almonds, butter and finished off with a good dusting of icing sugar. 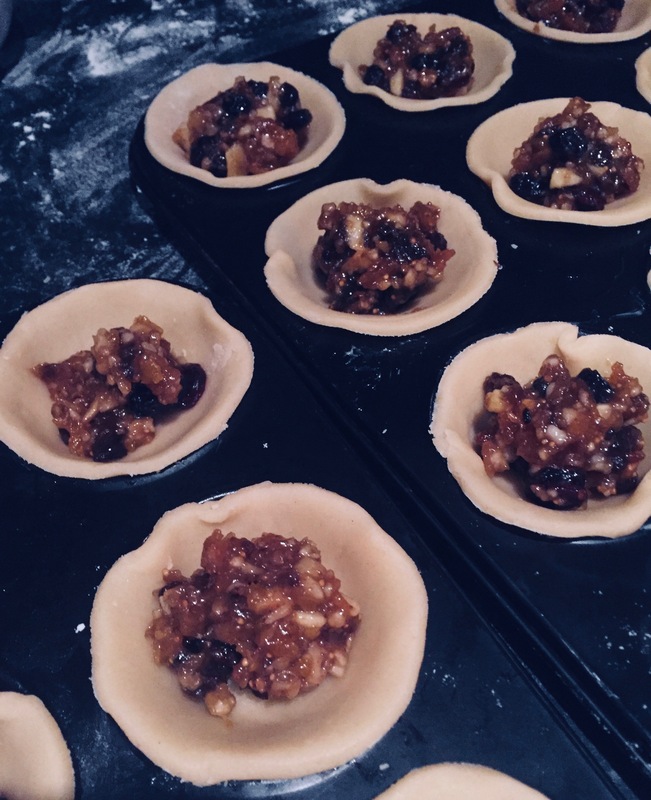 Here my mince pies are made with a rich, sweet, almond pastry and the mincemeat is ‘pimped’ with chopped dried figs, dates, apricots and walnuts. For me, it combines our two homelands perfectly with flavours, resonances and ingredients from both. After all, the currants, raisins and sultanas that are the staples of British holiday baking were of course traditionally from Greece. I couldn’t say whether this is a Greek recipe from an English kitchen, or an English recipe from a Greek one, but in our family that’s probably just fine. Happy Christmas and Καλά Χριστούγεννα ! 580 gm plain flour – you will need a bit extra as well, for rolling out the pastry. 5 tablespoons milk – and a little extra for assembling the pies. Sift the flour into a large mixing bowl, add the ground almonds. Add the butter and ‘rub’ it in to the flour and almond mixture with your fingers, until it resembles breadcrumbs. 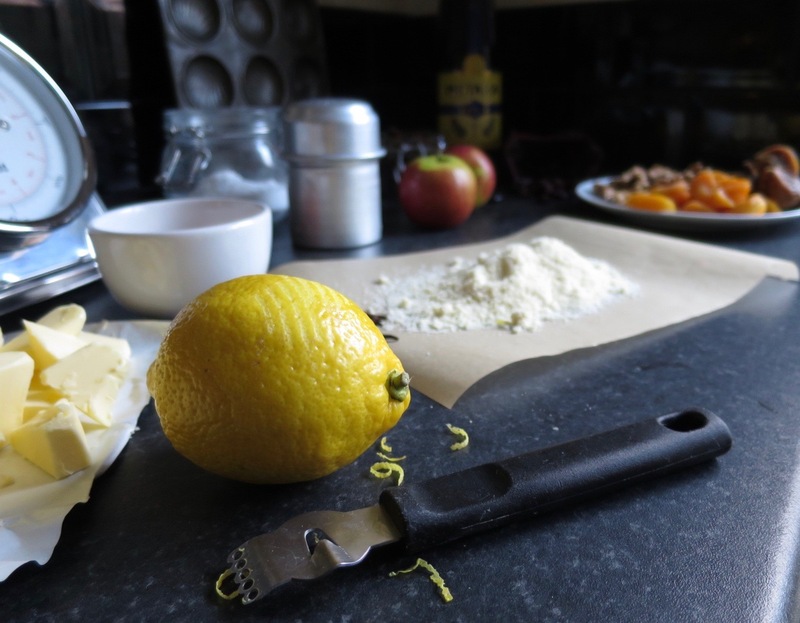 Add the sifted icing sugar and the lemon zest and stir in with a knife. Add the beaten egg yolk and half the milk and mix into the dry ingredients until you have a soft dough. You may need to add the rest of the milk during mixing if it needs it. Cover the pastry with cling film and allow to rest in the refrigerator for at least 30 minutes before rolling it out. This quantity of pastry will make 48 mince pies. 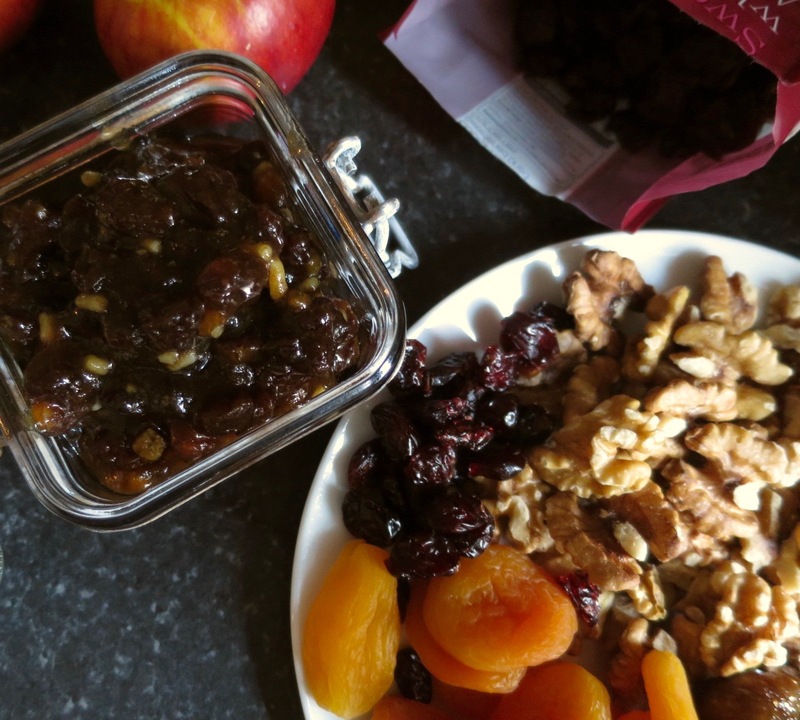 410 gm jar of mincemeat – it doesn’t have to be a very fancy one as you’re going to add lots of nice things ! Put the mincemeat into a good sized mixing bowl and add all the chopped nuts and fruit. Add the brandy and orange flower water, if using it, and mix well. This is enough mincemeat for 48 mince pies. You will need 4 x 12 hole ‘patty’ tins. Lightly grease them with a bit of buttered paper. Take the pastry from the fridge and put onto a lightly floured work surface. Roll out until it is quite thin with a floured rolling pin. This is a soft pastry and it’s important not to handle it too much as it will become sticky – the stickiness can be controlled by keeping the work surface and the rolling pin dusted with flour. Using a pastry cutter, or a glass, cut out discs of pastry approximately 7cm diameter – you will need 2 discs for each pie. Line the patty tins with half the pastry discs and put a small spoonful of the mincemeat into each. Now use the rest of the discs as pie tops. Brush the edge of each of these discs with a little milk before positioning and gently press them all the way round to form a seal. Don’t brush the tops with milk or beaten egg – they do not need a glaze. Put the pies in the oven and bake for about 20 minutes until a light golden colour. Carefully remove the pies from the patty tins and allow to cool on a cooling rack. If required, a clove can be inserted into the top of each pie. When they are cool, dust liberally with icing sugar and serve. They are possibly the best mince pies in the world 😉! Worked for me. See post on your Facebook page. Pastry extremely easy to handle. My oven is hotter and faster but that’s the way of the world! Great stuff ! Glad it worked – always glad when a recipe works !